Greedy me. Couldn't choose just one photo to represent each month of the year. So, hang on, grab a cup of jo or tea and relax for a few. 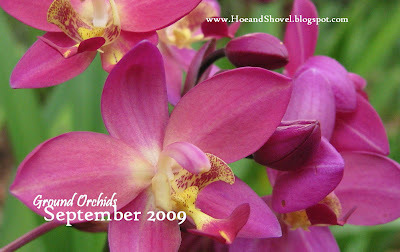 Here we go with Part 2, the second half of 2009 at Hoe and Shovel. 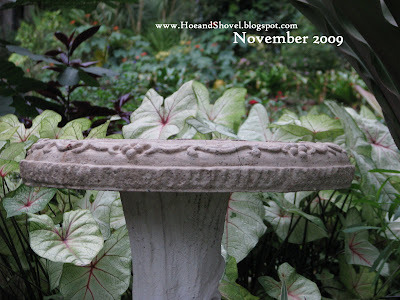 We'll have a look at some vignettes that remind us of how the garden grew July through December 2009. If you missed Part 1, January through June, you can catch it here. 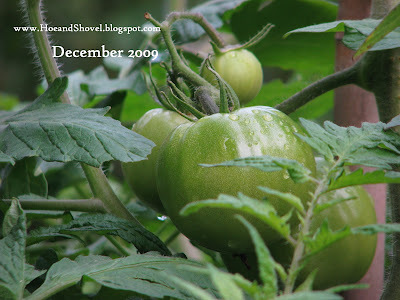 2009 had its victories and its failures both in the landscape and the vegetable gardens. The failures are noted and lessons have hopefully been learned. We find out our limits as well as our strengths when difficulties are handed to us. My wimpiest moments came following the two unusually heavy frosts in January. When the results were in and the damages calculated a few weeks later all my hard work from 2008 seemed for naught. My battle was fighting discouragement that threatened to squelch my excitement for future projects. To defeat those pesky spoilers we fight back and drown out the nagging thoughts with sheer determination to proceed. 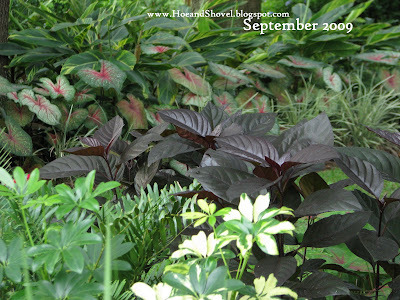 Plans for more durable plants such as the use of more native plants became my quest. 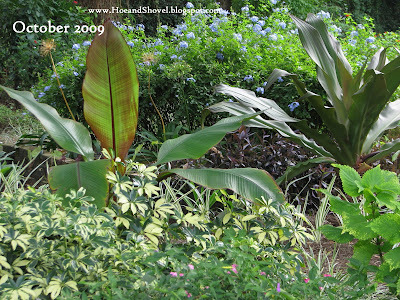 Even though I'm pretty sure my weakness for tropicalesque will never be replaced by a completely freeze resistant garden, learning more and more about correct placement and mixing them in with our Florida-friendly favorites has provided a greater dose of peace of mind. The adventure and can we say... utter thrill about being an avid gardener and gardening in the climate we live is in learning as we progress. 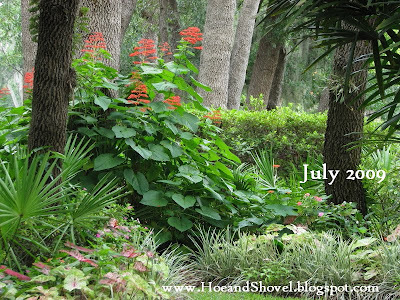 In Florida we have twelve glorious gardening months to carry out this great endeavor. 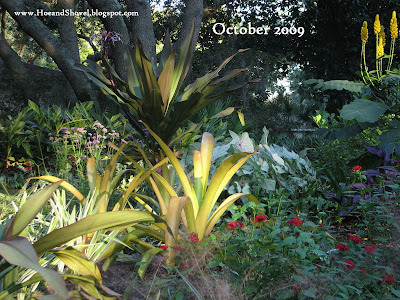 This fact which includes a spring veggie garden and a fall veggie garden is a challenge in itself. And yet what a blessing for someone who salivates at the thought of fresh, heaping mounds of healthy dirt and expectations of the promise every seed holds. 2010 is the start of a new year and a new decade. 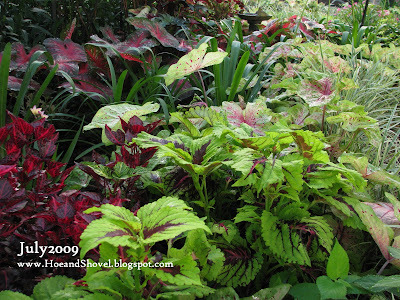 My gardening resolutions are many for today let's look at just one. It starts with burning visions for some new projects. Some visions leftover from 'big ideas' that stir around in the back of my mind on the long list of dreamy wishes; some have been forming recently as a result of inspiration from cooler weather, stirring up my fervor for design with plans and agendas and time-lines. Elements that tend to motivate my passion for gardening without end. This year, more than ever, no matter what I'm working on, my goal is to breathe in each experience, each precious hour spent in the garden. From the inspiration and creativity to the final load of mulch or the last harvest. Rather than tackle each project, as I tend to do with tenacious enthusiasm, to get it finished, check it off my list, and move on to the next one... I'm going to step it up a notch to make a conscious effort to settle into whatever it is I'm working on at the time. You know, linger in the moment. Fully capturing all the experience has to offer. I'll not let my mind skip ahead to the next thing while I'm enjoying the current thing. I'll give everything I have to the present and I'll take in everything the present has to offer. And when the present tries to cheat me or talk me into believing it doesn't have much to offer, we'll turn that around by learning something new or finding something good to take away from it anyway. It's true, this is not a new goal. I've had this as my goal before. Not just in gardening but in every part of my life. Zeal is great and we won't abandon it. But capturing the essence of each thing we take the time to do and give our energy to makes zeal so much more rewarding! With great anticipation of good things to come in 2010, and maturity on my side :-), I'm determined to tackle this one goal this year. You can be my helper. I give you permission to remind me when I wander off track. Here's to 2010! To learning new things each day, growing with my garden, conquering the challenges, reveling in the splendor, and above all ... peace in my soul through it all. 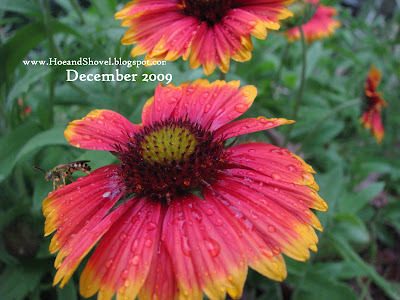 Happy 2010 to each dear reader and to your own gardens go and capture the precious moments! When you figure out how NOT to let your mind wonder, PLEASE do a post on it!! I wish I could slow my thoughts down a bit....about composting, is your pile in the sun, how often do you turn it and is it directly on the ground or in a container of some sort? thanks.. I'm working on it all the time. I really want to control this tendency I have to race through life. My grandchildren have helped me with this a lot! It is my desire not to waste (or lose) a single moment of the precious times spent with them. So I MAKE myself stop! and breathe in the times we are together. This works but takes lots (and lots) of practice for the person who likes to move on to the next thing quickly in order to get everything done. Anyway... like I said... I'm going to make a conscious effort to do this better this year... in every part of my life. There are a lot of ways to compost, I'm learning...I think directly on the ground is going to be the best way for me....guess what I'll be doing this New Year? Composting........hooray!!! I know what you mean about slowing down. I have people ask me if I ever sleep or sit down....I just feel like I'm wasting time.....thanks for the info Meems. You are always an inspiration! Yup...taking time to stop and smell those roses we're tending is always a good thing. Metaphorically as well as literally. Happy New Year, Meems, and I hope this is a frost-free year for you. 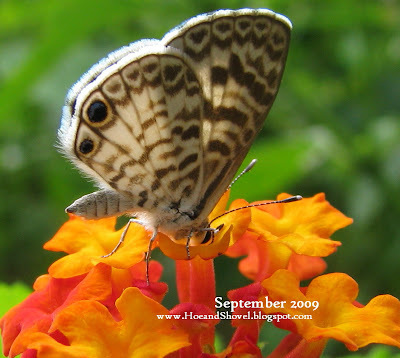 Well---I enjoyed Jan-June ---AND now I'm enjoying July-Dec..... One of my fav's is September with that gorgeous butterfly... Wow!!!!! Great pictures, Meems---ALL of them. the last half of the year is just as spectacular as the first 6 months. my heart does skip a beat seeing the banana leaves. 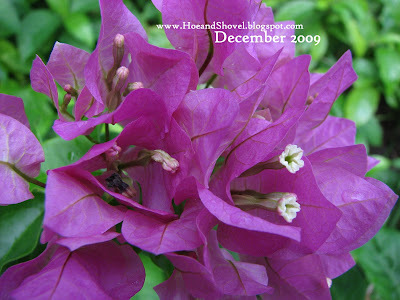 of course the bougainvillea reminds me of florida...makes me a little in need of a visit. i think gardening is such a life learning part of our lives...it will never end. that is what makes us keep on trying until we find what works. What a great, great post, Meems!Thank you! This is a great resolution, Meems! There's no better place than the garden for living in the moment, and yet it's hard not be distracted when we see weeds that need to be pulled or some other project that needs to be done. I really enjoyed your year-in-review calendar---both parts. For those of us in the frigid North, looking at photos of the past year are a great way to get inspired for the spring. 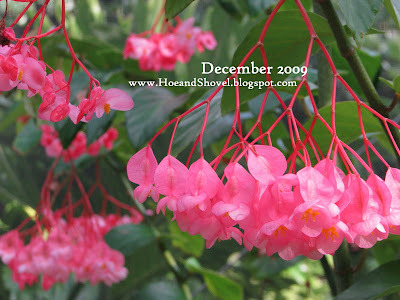 Best wishes for a Happy New Year and another successful gardening year, Meems! Meems - how did your yard and gardens do last night? Did you spend all of yesterday like I did, moving, covering and setting up heat lights? I took a walk around my yard this morning and a few things have obvious frostbite; many other things look pretty good. Temp in my yard (Jacksonville, FL) is up to 36 degrees Farenheit as of 9:45 am. One night down, four more nights of freezing temps to go. I'm keeping my fingers crossed that you are faring a little better than we - Lutz only shows one night of freezing temps on the weather.com forecast. 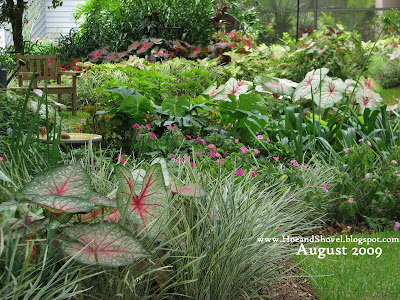 Eager to hear how your yard is doing. PS. I did not get my caladiums ordered by Dec 31. Just too many things to do. Did you? I get out in the garden and all the thoughts that cloud my mind start working themselves. 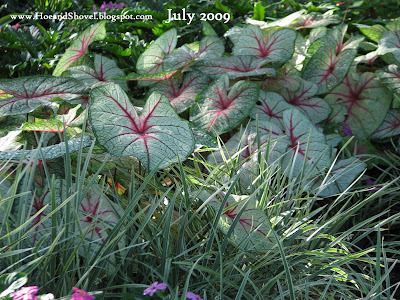 Can you give me the email address for ordering the caladiums please. Happy New Year! You'll be glad you got started. The key is to not stress over trying to do it perfectly. There are lots of combination percentages... just be sure to know what goes in and what doesn't and then let it take of itself. You can perfect it as you go if you care to. And... slowing down is a legit part of life. I've learned to 'schedule' down-time. that way I don't feel like I'm wasting time... after all it was in my plan...besides that~ down- time is healthy for you... that makes it a good thing. Looks like the north is already barreling down on us this week with the cold air mass that is sweeping the country. I'm not stressing over it though. Not a thing I can do to stop it. Happy New Year to you! That one is one of my faves too. Thanks for having a look. Loved your roses for the year! 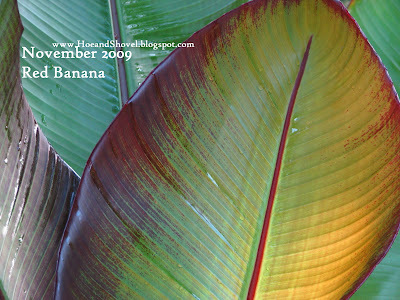 Those banana leaves are fun in every way until they brown around the edges. I'm leaving them on the plant this time of year... which you know is VERY hard for me to do. We'll see how they do this week with temps plunging so low for so many nights in a row. I find when I totally give myself to the thing at hand it becomes so much more fulfilling. For that reason I am determined to conquer this tendency to move too fast onto the next thing or worse yet be doing so many things at one time. We can DO it! So good to hear from you. YOu must be feeling better. At least I hope you are following doctor's orders and not typing too soon. LOL Good wishes right back to you, dear girl. Yay for increased technology. I know my blog must have given you a fit with dial-up. Nice to have some catch up time post-holidays after the rush we can all get caught up in. Happy New Year. Never easy to narrow down thousands of photos. Yes, I am all for some slow down time and some day-excursions. The garden is a great teacher! The frigid north is sharing with Florida this week. We are having a rare week of high's in the 50's and threats of freezing temps several nights in a row. 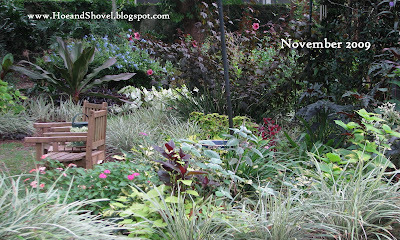 I'm hoping next week I'll still have some foliage left to share with you. Happy New Year! I thought about you New Year's Day when Mr. Meems and I were in that cold and rain of downtown Jax on Friday. The rain cleared out and got pretty but it was 'cold' all day long. Very good point. The garden is a great place to let all the worries of the world melt away. And I count on my gardening time for just that. Even so I can still be in a hurry to get on to the next thing on the list. Therein lies the rub. Meems, your garden always looks like a haven, and I understand the racing through life thing. You have the perfect garden for lingering and enjoying. Hi Meems, I like your kind of "greedy!" LOL I remember your frost last year and how unexpected it was to hear about plants in Florida succumbing to the cold. I could feel your pain. With such disappointments [don't I know] it can be a challenge to get back up but as your photos attest, you've so beautifully accomplished this. 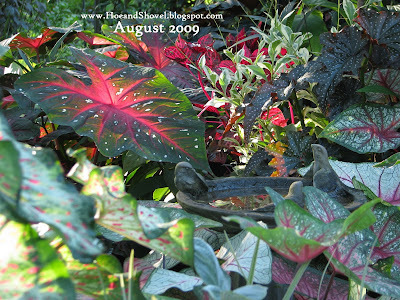 I remember last summer while wandering about my garden, stopping to admire a particular vignette and wishing there was a way to grab this intangible feeling of joy that I got from looking at it. Of course it can't be done so I agree with you, living each in each moment is so important. We know how fleeting those moments are. Bless you in 2010.